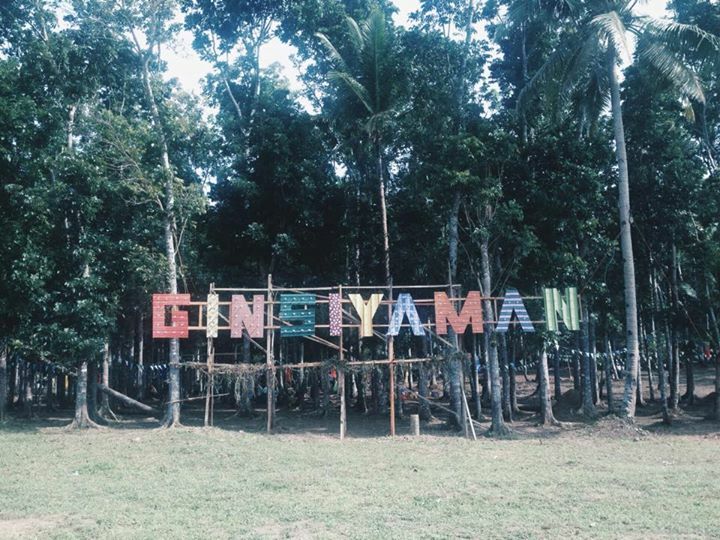 This year saw the very first Ginsiyaman Music Festival, set in a vast farmland in San Miguel, Leyte. It was a scene straight out of an outdoorsy instagram post. A tree by the river was wrapped in all sorts of festive cloth, there were freshly chopped wood everywhere, colorful lanterns and flag banners snaked through tree trunks all around the camping grounds. I went with a good friend of mine who got invited to create an art installation with the theme "Rebirth". Our idea was to simulate a womb where people can enter and revisit a delicate time in their (pre)lives and be metaphorically rebirthed when they exit the structure after ample contemplation. 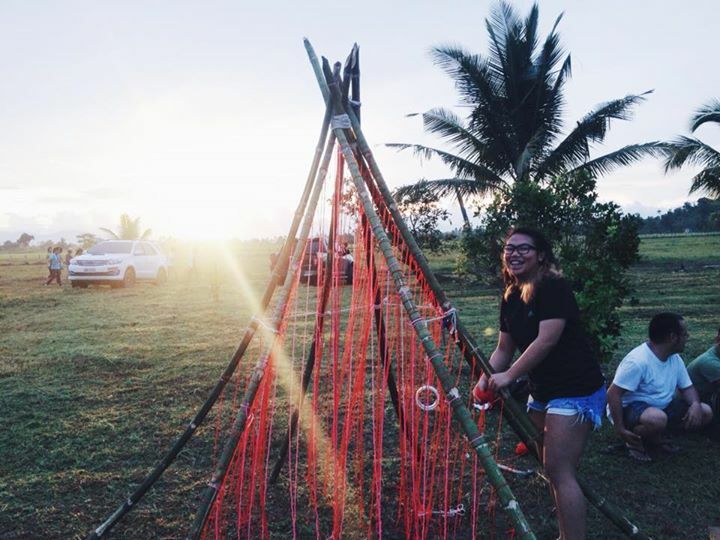 Using as much recycled materials as possible we were able to build a makeshift teepee using bamboo poles and newspaper, and filled the interior with a bunch of red and white yarn to symbolize the warm, comfy, nurturing womb. But really it was just an excuse to make a vaginal teepee. 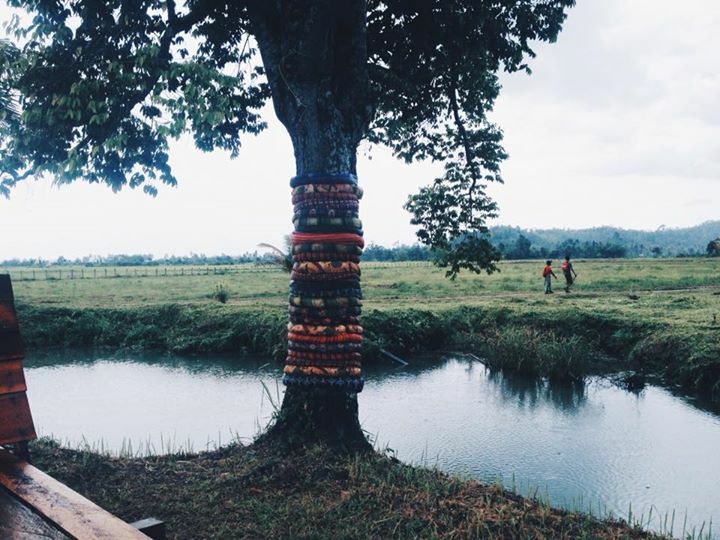 Other art installations dotted the landscape, transforming the space of the expansive grounds. One had several twigs lined up on the soil, mirroring the towering trees nearby. A jellyfish with its head the size of a basketball hung from a tree branch. As the day went on, more and more people started setting up camp, which grew up to 20 or so tents that reached all the way to the far edges of the forest. 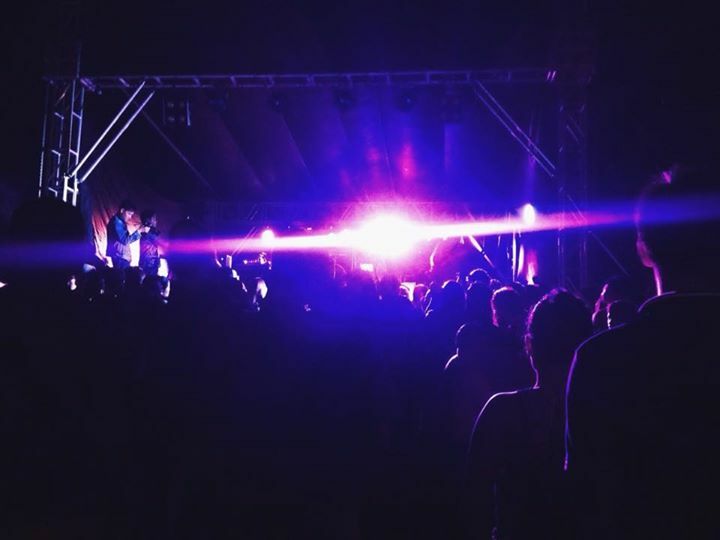 More and more foldable chairs and banigs were laid on the concert grounds as the roster of homegrown and local artists took to the stage. The incredible lineup featured no less than Up Dharma Down, Ang Bandang Shirley, The Strangeness, Pulso, to name a few. People were draping their arms across each other's shoulders, swaying as they fully immersed themselves in the music. This one guy was contorting his body to a weird, ritualistic dance, but then we realized he was probably just drunk. But he was definitely a crowd favorite. 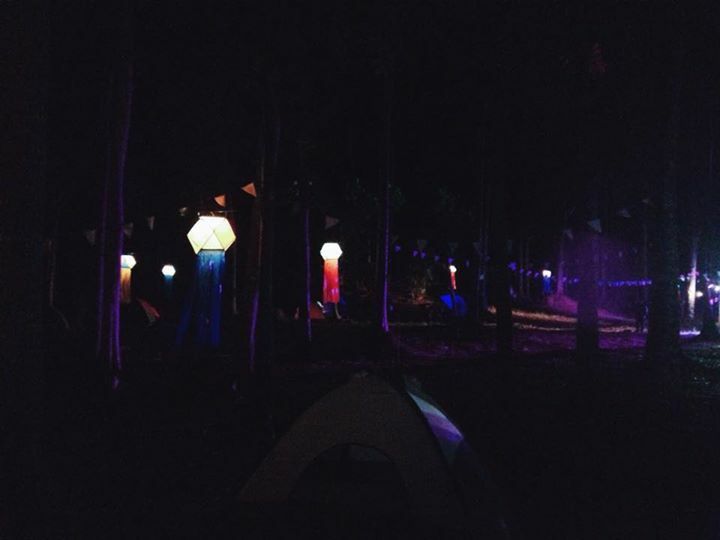 At night, the whole place transformed into a glowing, breathing landscape. The big GINSIYAMAN letters lit up like fireflies, the jellyfish looked iridescent as christmas lights lit up from inside. Bonfires as tall as people crackled like living creatures. This one little duck quacked out of his home to see what all the fuss was about. I affectionately named him Frank and took a picture. 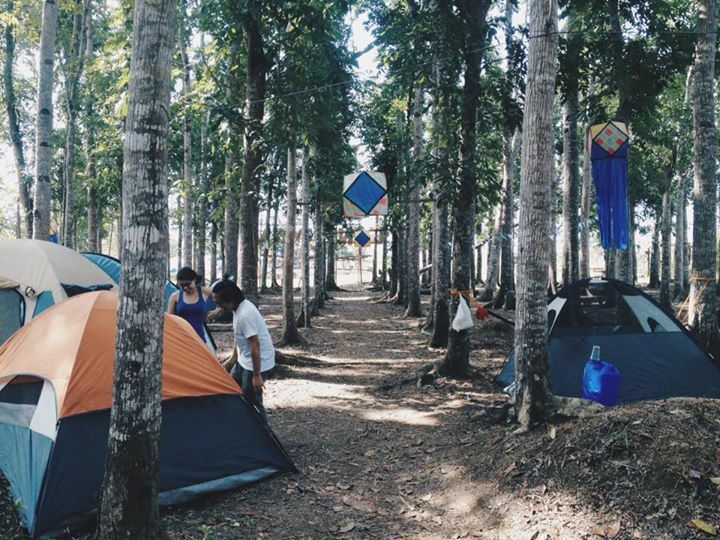 When Up Dharma Down's great set was done, an afterparty commenced in the area just beside the camping grounds where trippy blue-violet-yellow strobe lights made the trees look like they were dancing. Party music ensued until dawn and one by one, people went back to their tents and called it a night. The morning after looked exactly as you would expect. Some people were still snoozing in their hammocks, clothes and t-shirts were hanging off trees, people were chilling in their tents and we were passing around sachets of Lady's Choice sandwich spread. I looked for Frank but he was probably back in his home by the river. We took a good look around the area before packing our stuff. Our little teepee was still modestly standing up in a patch of land partly surrounded by the river. What an awesome weekend. I hope we get to see something like this in Cebu soon. See you, Leyte. 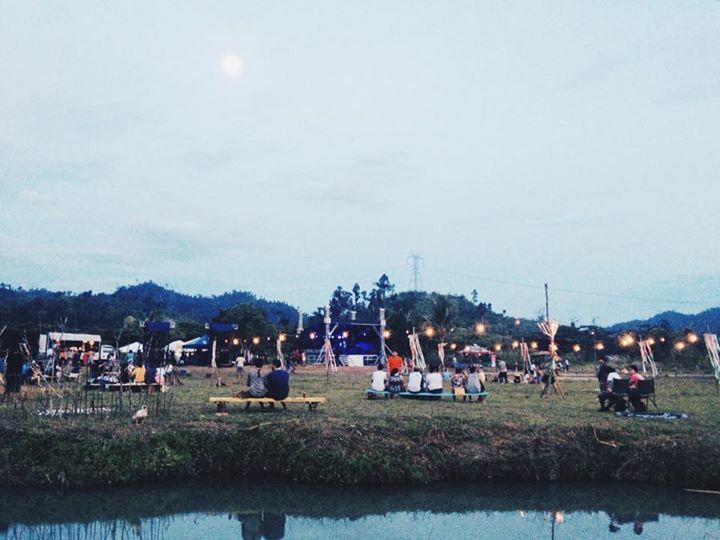 (The Ginsiyaman Music Festival happened on September 26 & 27, an event dedicated to all those who have helped rebuild Leyte after the greatly devastating Typhoon Haiyan in 2013).